The video offers a brief introduction to the concept of vertical farming, an innovative method that may have implications for urban living in the future. 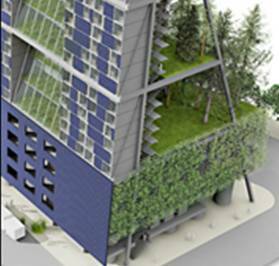 The project shown is the Center For Urban Agriculture – a ‘classic’ conceptual high-rise net-zero vertical farm that the architects Mithun designed for the Cascadia Green Building Council’s 2007 Living Building Challenge. If you want to know more about vertical farming, this website gives a really detailed explanation of the concept with some quite cool pictures. The top picture on there is a photo of what’s called a Living Tower that looks a bit like a multi-storey car park – which raises the question of whether some existing multi-storeys could potentially be repurposed as vertical farms, which might perhaps be an even greener approach? Vertical farm or converted multi-storey car park? The Wikipedia page about vertical farming describes it as “a proposed agricultural technique involving large scale agriculture in urban highrises or farm-scrapers”. A BBC report has a video podcast describing how a UK zoo is testing vertical farming as a way of growing crops to feed some of its animals which cuts running costs and allows the animals to forage for their food. In the podcast the reporter also interviews Chris Bradford, the UK’s first vertical farmer who gives a brief explanation of the benefits of vertical farming. Even Sting and his wife, Trudie Styler have managed to get in on the act and Sting is actually planning to produce a film on the subject! Are there any disadvantages to vertical farming? This article identifies one of the disadvantages as being that huge investment will be needed to start these vertical farms and that the high-rise buildings would be at risk from “natural calamities like earthquakes”. Another article lists one of the potential drawbacks as being the fact that the farms are likely to be irrigated using black water which may put people off buying the resulting crops. The article listed quite a few other disadvantages, including the fact that the systems would be largely automated and the impact this may have on occupations like farming, delivery drivers and garbage collectors. It also states that there could be a more limited variety of fresh foods offered, as not all plants and vegetables are suited to being grown in this type of environment. ‘This guy talks like he’s never actually been in an unlit multi-story building. This does actually give a bit of food for thought and makes one wonder if these highrise farms would suffer from a reduction of light if they’re surrounded by other highrise buildings. Perhaps that’s a problem that could be overcome by siting the vertical farms next to the mirrored buildings that seem to be quite common in many cities these days so that they can take advantage of reflected light. Would the type of laminate that’s used to give a mirrored finish to buildings provide sufficient reflected light to allow the plants to grow? Would this require the business model to ‘factor in’ the costs and benefits of ‘doing a deal’ with adjacent buildings? Is there anybody out there that knows the answers to some of these questions? How relevant are 'parenting issues' to today's innovation investment?